Exactly when Galento debuted is not known. It's thought to be sometime in the 1930s though. By the 1940s Galento was touring the United States and had made quite a name for himself in places like Georgia, San Francisco and Kansas. Of course though, Galento by the end of the 1940s was a star in Memphis, Tennessee and by the early 1950s was a huge attraction in Oklahoma also. As many wrestlers had done before and would do after him, Galento's fame in those areas arose from his take on all comer challenges. $100 was offered to any local man who could hang with him. It's said Galento actually lost a couple of these matches via disqualification due to his short temper leading to him just beating on the challengers using any means necessary. His stardom certainly was not limited to those two territories though. 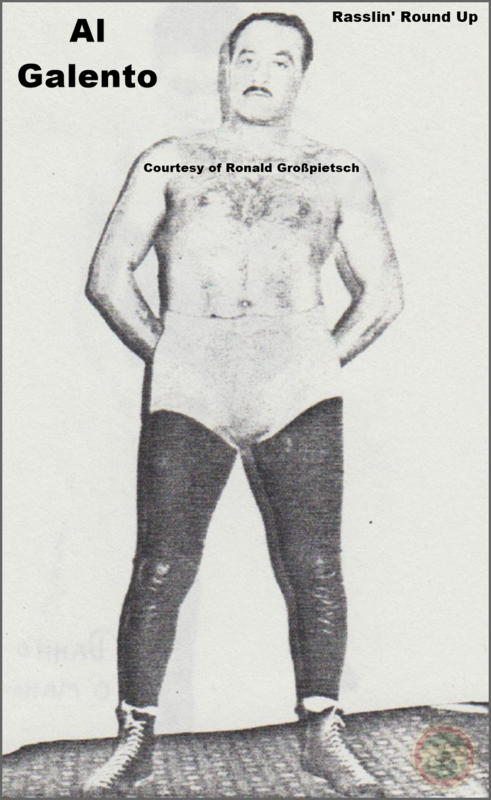 His drawing power in the other aforementioned areas grew immensely during the same decade and by 1960 he had reached a high level of fame in the Gulf Coast region too holding the GCWA Mississippi Heavyweight Championship in that year. To fans who were not around back then he is probably most well known as the older "brother" of Mario Galento. In fact, the Spider helped train Mario, whose real name was Bonnie Lee Boyette. Al impressed by the youngster and realizing he could do with a tag partner to add longevity to his career now he was getting older, Galento renamed Boyette and the pair tagged together. The pairing was only short though. It's said the more Galento was around Mario, the more he grew to hate him. By the end of the '60s Al "The Spider" Galento retired from in-ring competition, but he had found himself a permanent home as a manager in the Gulf Coast. Names like Jackie Fargo, Jack Donovan, the Hines Brothers, the Carson Drothers, Duke Savage and Sweet Daddy Watts all found themselves guided to the ring by Galento. Not only did Al Galento leave his legacy through Mario Galento though, he also trained King Kobra, Wild Bill Ash, and Tommy Gilbert. It appears by the beginning of the 1980s Galento was fully retired, however, what happened to him after that I am not sure.